The External Storage Support application enables you to mount external storage services and devices as secondary Nextcloud storage devices. You may also allow users to mount their own external storage services. Nextcloud 9.0 introduces a new set of occ commands for managing external storage. 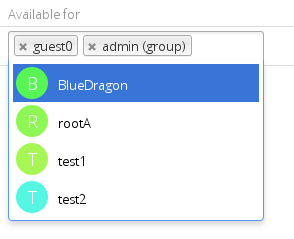 Also new in 9.0 is an option for the Nextcloud admin to enable or disable sharing on individual external mountpoints (see Mount options). Sharing on such mountpoints is disabled by default. Required fields are marked with a red border. When all required fields are filled, the storage is automatically saved. A green dot next to the storage row indicates the storage is ready for use. A red or yellow icon indicates that Nextcloud could not connect to the external storage, so you need to re-check your configuration and network availability. Enable Sharing allows the Nextcloud admin to enable or disable sharing on individual mountpoints. When sharing is disabled the shares are retained internally, so that you can re-enable sharing and the previous shares become available again. Sharing is disabled by default. When using self-signed certificates for external storage mounts the certificate must be imported into the personal settings of the user. Please refer to Nextcloud HTTPS External Mount for more information. The following backends are provided by the external storages app. Other apps may provide their own backends, which are not listed here. Google Drive and Dropbox were moved to external apps which are still in development (Github-Repos for Google Drive and Dropbox). We recommend configuring the background job Webcron or Cron (see Defining background jobs) to enable Nextcloud to automatically detect files added to your external storages. Nextcloud may not always be able to find out what has been changed remotely (files changed without going through Nextcloud), especially when it’s very deep in the folder hierarchy of the external storage.